Three recent cartoons in my feed that depend on their readers supplying crucial bits of background cultural information: a Rhymes With Orange from the 1st (the eating habits of Japanese movie monsters); a Mother Goose and Grimm from the 1st (the His Master’s Voice dog); and today’s Bizarro/Wayno collab (clergy visiting parishioners). In each case, the cartoon shows some situation from everyday life (which you have to know about) juxtaposed with, or translated into, another more remarkable world (which you also need to know details of). 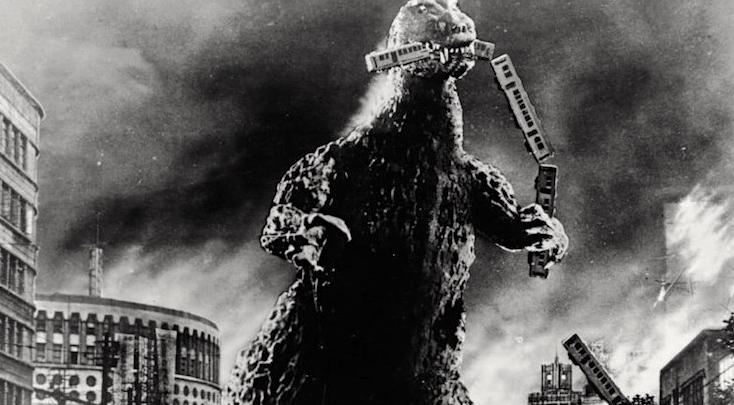 Rhymes: workers feeding creatures on lunch break, the appetities of Japanese movie monsters. 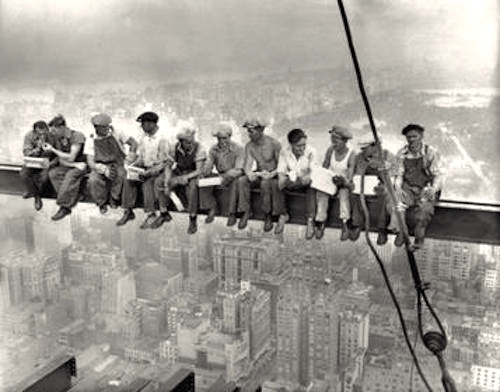 The everyday situation is workers having their lunches, out of doors if possible, on benches, in a park if there’s one close by. 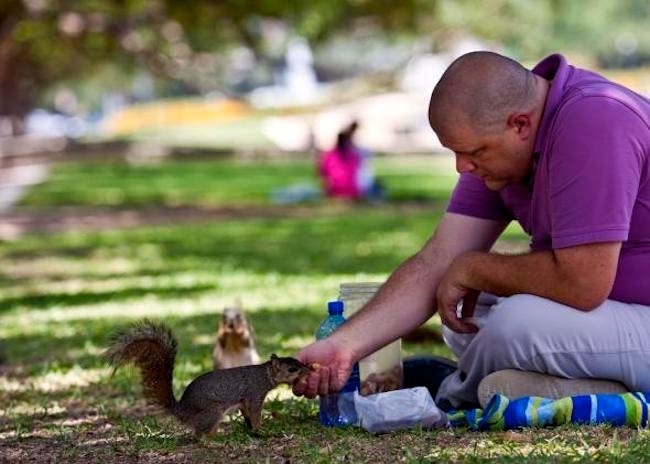 Anywhere out of doors, they’re importuned by creatures (pigeons, but especially cheeky squirrels) for bits of food. #1 maps the lunch-break world into the world of kaiju, Japanese monsters, especially in the movies. MGG: finicky audiophiles, Nipper the phonograph dog (and the dogs Grimm and Ralph). The everyday situation is a complaint about the passion of some men for audio perfection, especially over the superiority of recordings on vinyl disks — records — over later media. All of that has been translated into the world of dogs: the talking (and generally very anthropomorphic) dogs Grimm and Ralph from MGG, as they view their audiophile companion, who you have to recognize as the dog advertising various phonograph / grammophone companies. 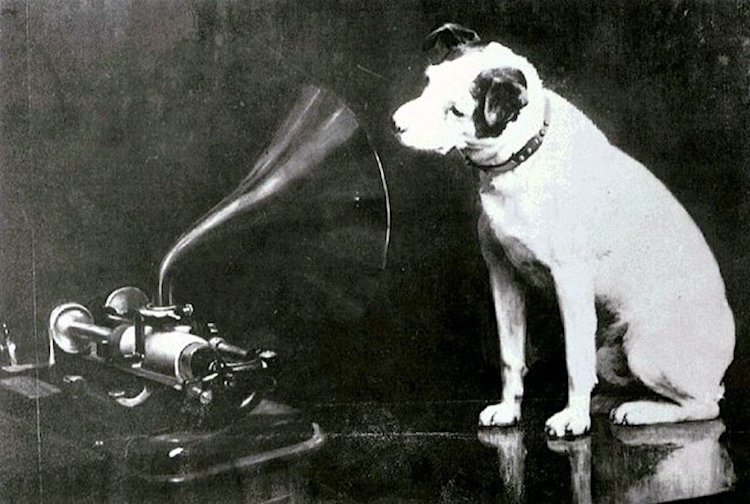 Nipper (1884–1895) was a dog from Bristol, England, who served as the model for a painting by Francis Barraud titled “His Master’s Voice”. 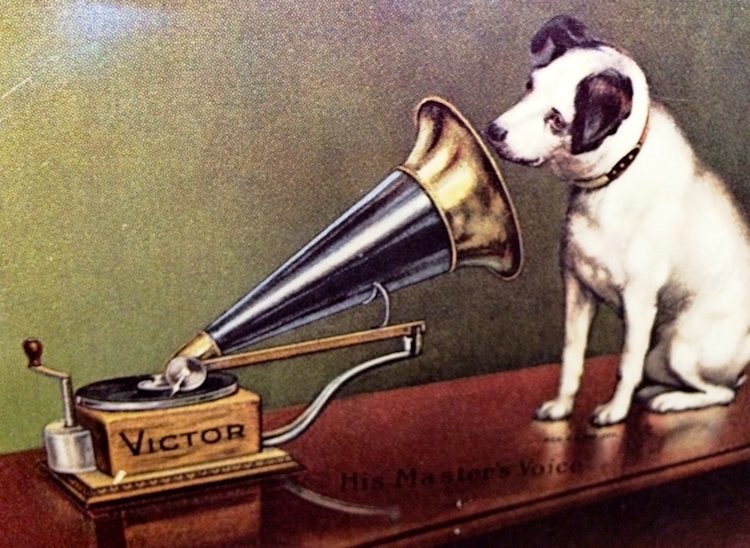 This image was the basis for the dog-and-gramophone commercial logo, one of the world’s most famous used by several audio recording and associated company brands, including Berliner Gramophone and its various successors, affiliates, and successors, including Berliner’s German subsidiary Deutsche Grammophon; Berliner’s American successor the Victor Talking Machine Co. (later known as RCA Victor and then RCA Records); Victor’s Bluebird label; Zonophone; Berliner’s (and later Victor’s) British affiliate the Gramophone Co. Ltd. (informally known as His Master’s Voice) and its successors EMI and HMV Retail Ltd.; the Gramophone Co.’s German subsidiary Electrola; Zonophone; and onetime Victor subsidiary the Japan Victor Company (JVC). Bizarro/Wayno: a clergical visit for a meal, the life of dogs. You need to recognize the situation: a young couple, presumably husband and wife, are standing at the front door of their house (you might reflect on what signals that interpretation), facing a clergyman, who is thanking them for having him in their house (he says that) and giving him a meal (that’s not quite what he says). Here you need to recognize the things that pick him out as a clergyman who’s just had a meal with the couple. A clerical collar, clergy collar, or Roman collar, is an item of Christian clerical clothing. The collar closes at the back of the neck, presenting a seamless front. The shirt may have the collar built in. The clerical tab is almost always white and was originally made of cotton or linen but is now frequently made of plastic. Sometimes it is attached with a collaret or collarino that covers the white collar almost completely, except for a small white square at the base of the throat, and sometimes with the top edge of the collar exposed to mimic the collar of a cassock. It may simply be a detachable tab of white in the front of the clerical shirt. The clerical shirt is traditionally black (or another color appropriate to a person’s ministry rank, such as purple for Anglican bishops), but today is available in a variety of colors depending on the wearer’s preference. Once the clerical collar is removed the garment is indistinguishable from any other shirt. 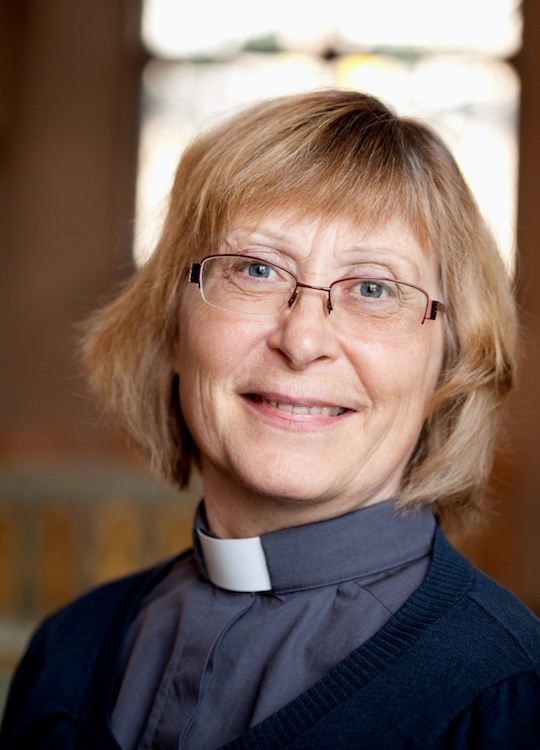 When clergy are delivering sermons, they sometimes attach preaching bands to their clerical collar. … Invented in the Presbyterian Church [1840-1880], the clerical collar was adopted by other Christian denominations, including Anglican Church, Methodist churches, Eastern Orthodox Church, Baptist churches, Lutheran churches, and the Roman Catholic Church. Prior to the Second Vatican Council (1962-1965) the practice of Roman Catholic clergy wearing the clerical collar as street-dress tended to be found only in those countries where Catholicism was the minority religion. It was mandatory for U.S. Catholic priests starting in 1884. In the 1960s, many clergy who lived in countries where Catholicism was the dominant religion also began to wear the clerical collar rather than the soutane or cassock. P1. to break bread: (a) to break it for one’s own mouthfuls; hence to eat or partake of bread or food; (b) (from the New Testament) to break it for distribution to others, to dispense bread, or fig. the bread of life; also to break the sacramental bread in the Communion of the Lord’s Supper, to administer or join in the Communion. Lamentations 4:4: The tongue of the sucking child cleaveth to the roof of his mouth for thirst: the young children ask bread, and no man breaketh it unto them. Mark 14:22: And as they did eat, Jesus took bread, and blessed, and brake it, and gave to them, and said, Take, eat: this is my body. 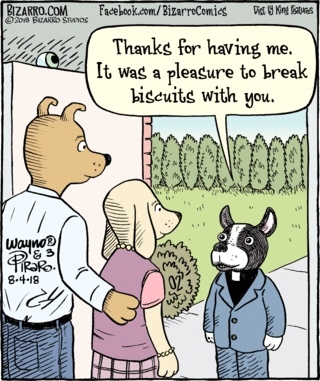 So, in #9, a scene of a cleric with two of his parishoners is translated into a canine equivalent, with break biscuits (dog biscuits) replacing break bread. This entry was posted on August 4, 2018 at 4:16 pm and is filed under Clothing, Comic conventions, Language and animals, Linguistics in the comics, Movies and tv, Slang, Understanding comics. You can follow any responses to this entry through the RSS 2.0 feed. You can leave a response, or trackback from your own site.